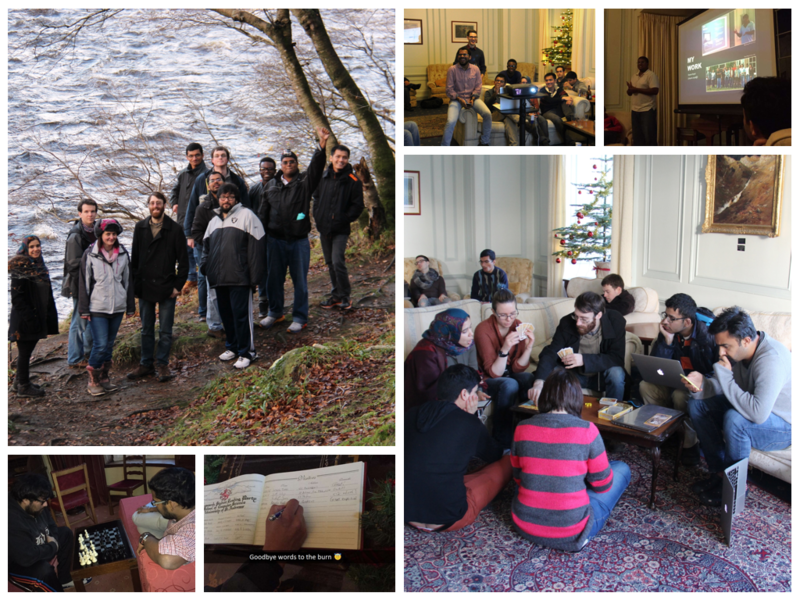 The 2015 PhD Reading Party was held at the Burn, a Georgian Mansion at the foot of Glenesk in the North East of Scotland in December last year. It was an opportunity for research students to network, brainstorm and talk about their research and interests with colleagues in a relaxed atmosphere. There were twenty-two (22) student talks, each of which lasted for up to 10 minutes including time for questions and discussions. Two members of staff – Ruth Letham and Ozgur Akgun – also gave talks, the former on teaching opportunities and career paths and the latter on reproducible research and research streams in academia. At the end of the talks, the staff members provided feedback and facilitated small group brainstorming sessions based on the interests and research themes that emerged. It wasn’t all work and no play, as the gang explored the scenic landscape, wandered through the nearby woods and streams, and contemplated the complexities of the universe while star-gazing at night. Indoors, the gang played pool, table tennis, darts and cards, and participated in organised activities including a pub quiz (because there’s no such thing as too much trivia knowledge), presentation karaoke (because extemporising is fun and useful) and a host of board games (because why not? ).